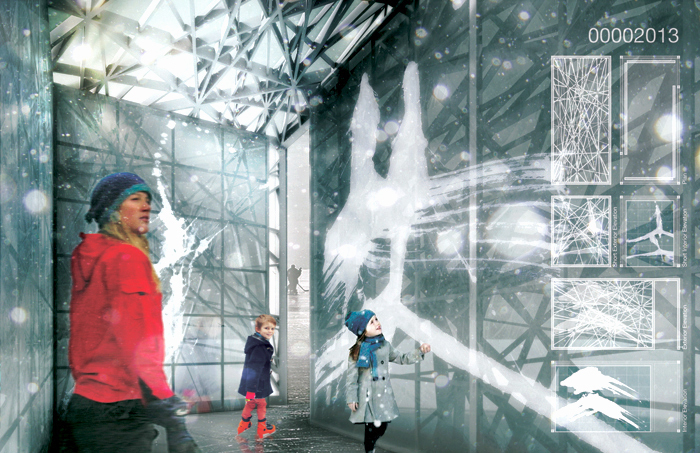 A design for a competition entry for the Warming Huts annual competition in Winnipeg, Canada. The project was in collaboration with architects for a temporary pavilion along the forks, which is open to skaters in the winter months. We live in an age caught in the middle of a digital revolution, yet as humans we need to sense our world through the analogue. 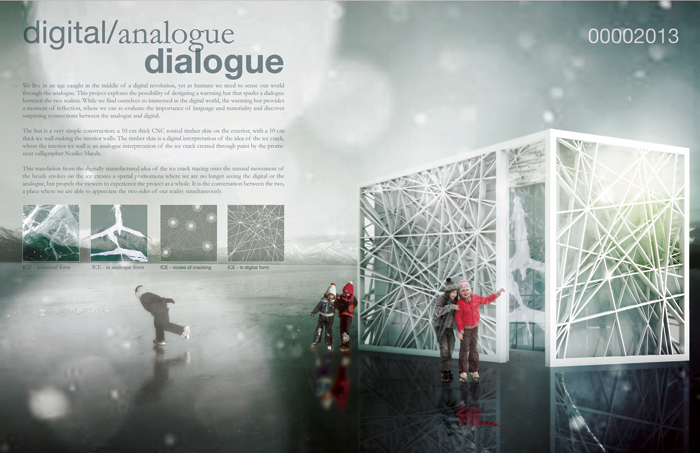 This project explores the possibility of designing a warming hut that sparks a dialogue between the two realms. While we find ourselves so immersed in the digital world, the warming hut provides a moment of reflection, where we can re-evaluate the importance of language and materiality and discover surprising connections between the analogue and digital. The hut is a very simple construction; a 10 cm thick CNC routed timber skin on the exterior, with a 10 cm thick ice wall making the interior walls. The timber skin is a digital interpretation of the idea of the ice crack, where the interior ice wall is an analogue interpretation of the ice crack created through paint by the prominent calligrapher Noriko Maeda. This translation from the digitally manufactured idea of the ice crack tracing onto the natural movement of the brush strokes on the ice creates a spatial phenomena where we are no longer seeing the digital or the analogue, but propels the viewers to experience the project as a whole. It is the conversation between the two, a place where we are able to appreciate the two sides of our reality simultaneously.